Diode lasers are a common tool in today’s physics laboratories. Because the wave length of these lasers is relatively easy to sweep, they are particularly useful in all sorts of spectroscopy experiments. In this Immersion, we will explore the S1/2 - P3/2 transition (780 nm) of both isotopes of rubidium (87Rb and 85Rb) in a multitude of configurations. Using counter-propagating ‘pump’ and ‘probe’ beams, generated by the same laser, to produce Doppler Free spectroscopy, we will look at and measure hyperfine splitting. We will then use the apparatus for a set of other experiments chosen from a variety of options, such as using an unequal arm Michelson to calibrate the frequency sweep, creating side bands and analyzing with a Fabry-Perot cavity, doing Resonant Faraday Rotation, or creating Coherent Population Trapping (CPT) in Zeeman sublevels. Although this Immersion will use the TeachSpin Diode Laser Spectroscopy apparatus shown in the photographs, these experiments can be adapted for a home-built apparatus. Figure 1: Apparatus set up for simultaneously doing saturated absorption spectroscopy and using an unequal arm Michelson to calibrate the laser frequency sweep. Figure 2: Left: Doppler broadened absorption lines. Right: SAS absorption lines within Doppler curve. Expanded discussions of the physics and descriptions of the experiments are available on the TeachSpin website (www.teachspin.com). The Conceptual Introduction, written by Professor David Van Baak of Calvin College and past president of ALPhA, offers a particularly helpful overview before beginning the experiment for both faculty and students. Figure 3: Control Box for these experiments. The Session will begin with the physics of the diode laser itself, including the effects of grating angle, diode current and temperature. We will also get into the practical aspects of using the laser, aligning and tuning it for use in our experiments. This will lead us to the observation of the Doppler broadened rubidium absorption signals as the laser light passes through a heated cell containing both isotopes of rubidium. After looking at the laser modes, we will expand the wavelength range by linking the sweep of the laser current to the piezo sweep of the grating angle. Using mirrors and beam-splitters we will create overlapping, counter-propagating ‘pump’ and probe’ beams. This optical configuration produces saturated-absorption or ‘Doppler-free’ spectroscopy. Limited only by the natural linewidth (<10MHz, out of an optical frequency of about 385 million MHz) of the atomic transitions, we will look at absorption lines that would otherwise be unobservable in a gas near room temperatures. 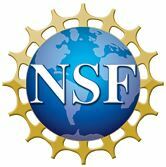 Once comfortable with the apparatus, participants will be able to choose several of the following projects, depending upon their particular interests or the topics they feel will be most relevant for their students. 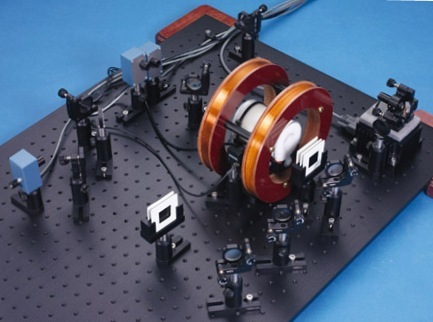 Michelson Interferometer: Setting up a non-equal arm Michelson interferometer to calibrate the frequency sweep. This project involves setting up an interferometer using invisible beams – always an optics challenge. Fabry-Perot Cavity: Aligning and tuning a confocal FP cavity. This includes the calibration of spectroscopy signals and observation of laser side bands created by fast current modulation. In a non-confocal mode, one can also see the Laguerre-Gaussian modes of the cavity. Kramer-Kronig Relations: Setting up a Mach-Zehnder interferometer to observe phase shifts associated with the absorption. In addition to aligning an invisible beam interferometer, this project involves mathematical analysis of the signals which would require some pre-lab readings. Laser Locking: Locking to the side of an absorption feature. This is primarily about electronics. There’s not much physics to do with the laser once it is side locked but it is certainly fun! Resonant Faraday Rotation: Faraday rotation is much enhanced near an atomic resonance. This project could also lead to trying another locking technique – DAVLL (Dichroic Atomic Vapor Laser Lock). Tuning to 795 nm: With a cold diode, the laser can be tuned to the 795 nm S1/2 - P1/2 rubidium transition. The simple spin states of this transition make observing the Zeeman levels less complicated. CPT (Coherent Population Trapping) in Zeeman sublevels: This is a very simple optics set-up that involves some very nice current physics. The latest chip scale atomic clocks by Symmetricom use the same physics applied to the hyperfine sublevels. Participants should bring their own scientific calculators and some sort of data book. Laser goggles will be provided at the Immersion. A complete Diode Laser Spectroscopy system can be purchased for less than $18,000. Many schools with optics programs will have most of the components available and could certainly put together an apparatus of their own design. 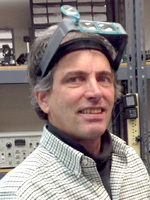 After completing his Ph.D. at the University of Buffalo, where Jonathan Reichert was his thesis advisor, George Herold worked at TeachSpin for several months designing some of the electronics for its first pulsed NMR, PS1-A. A few postdoc positions later, he signed on as a staff scientist at the W. M. Keck Free Electron Laser at Vanderbilt University. The threat of funding loss combined with incipient fatherhood brought George back to Buffalo, where TeachSpin had grown enough to need another full-time physicist. His first jobs were to complete the development of the Optical Pumping apparatus and build, from first wires, the Signal Processor/Lock-In. At TeachSpin George continues to develop elegant instruments, do the final pre-shipment testing that provides reference data for many instruments, and generally trouble-shoot both construction and user questions. George Herold, Ph.D., Senior Scientist, Teachspin, Inc., 2495 Main Street, Suite 409, Buffalo NY 14214-2153. Email: gherold@teachspin.com.